You cannot add "Drawing on Metal with Deb Karash" to the cart because the product is out of stock. This six day masterclass with Polish art jeweller Iwona Tamborska will take your metal clay work to a whole new level. Dates are Thursday 18th October to Wednesday 24th October 2018. 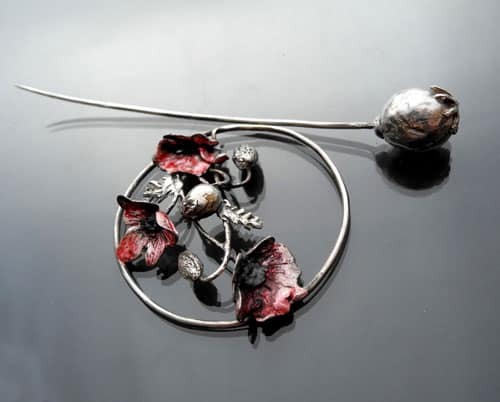 Sterling silver tube, wire and metal clay are included in the price of the course. Instalment payments available for this course. This six day narrative jewellery masterclass with Polish art jeweller Iwona Tamborska will take your metal clay work to a whole new level. The course runs as four consecutive days, a rest day and then two final days. It spans seven days in all. Dates are Thursday 18th October to Wednesday 24th October 2018. You can pay for this course in one go using the ‘add to cart’ link or secure your place with a £100 deposit and pay the balance by 18th September 2018. If you would like to take advantage of this interest free instalment option, please contact the school to set it up. You will create narrative jewellery which tells your own story. 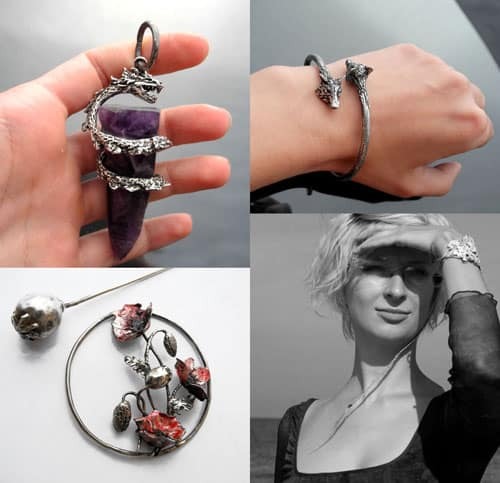 Combining traditional silverwork techniques with metal clay you’ll create totally unique statement jewellery with the wow factor. All the materials are included in the price except for the second project. For this project, you have personal choice for the focal piece. After signing up for the class, you will be given more information on this together with the tools you’ll need to bring if you have them. To see a full list of what’s included in the price, see below. Iwona’s work has a strong narrative quality resulting in some incredibly complex designs. 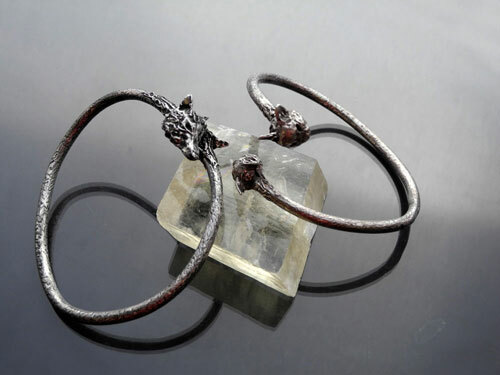 By combining silver tube, wire and metal clay, she creates light, highly sculptural pieces. During the six days you spend with her, you’ll learn her approach, what inspires her and how she designs her amazing creations. Iwona will help you to tell your own stories through your work and teach you how to realise your design ideas. 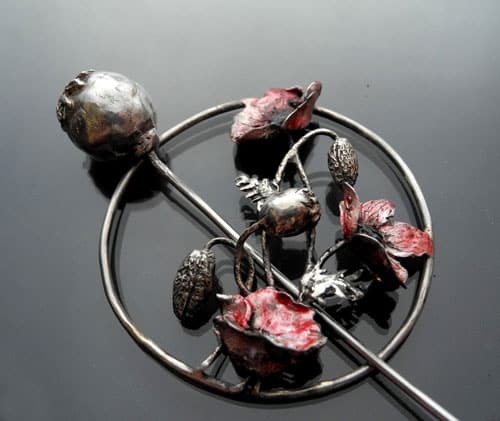 This course is suitable for metal clay intermediate or advanced level metal clay artists. 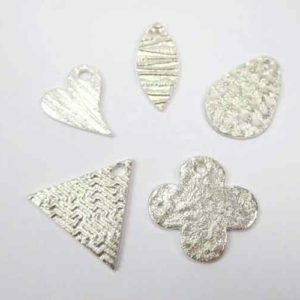 You don’t need to have any experience of working with silver in a traditional way. Iwona will teach you all you need to know to create these stunning pieces of jewellery. You’ll be doing quite a bit of soldering on this course but you only need a very basic understanding of soldering at the beginning. The projects are structured so that your silver work, soldering and metal clay skills will develop as you go along. The course may also appeal to traditional silver workers who have used metal clay to an intermediate level. If you want to see how these two materials can work together successfully, this course is for you. If you’ve ever struggled with soldering, after spending this time with Iwona you will be able to solder anything to anything! Imagine the possibilities of being able to design and create pieces of jewellery that are not only works of art but tell the story in your head. 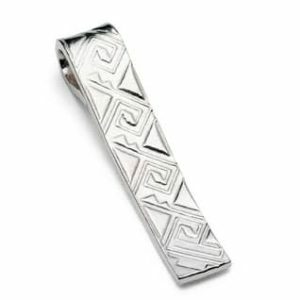 By the end of the course, you will fully understand the potential of combining traditional silver techniques and metal clay. And you’ll know how you can use this to create one-of-a-kind, statement jewellery. There are three projects in this masterclass, building on skill and technique with each one. The first project is a bracelet based on a hollow Sterling silver tube combined with fine silver clay. Skills learned in this class include sculpting with metal clay, working with Sterling silver tube and soldering. 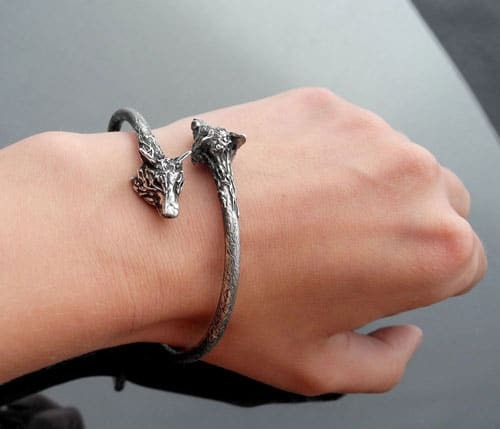 You will be able to create the two ends of the bracelet in whatever design you choose. 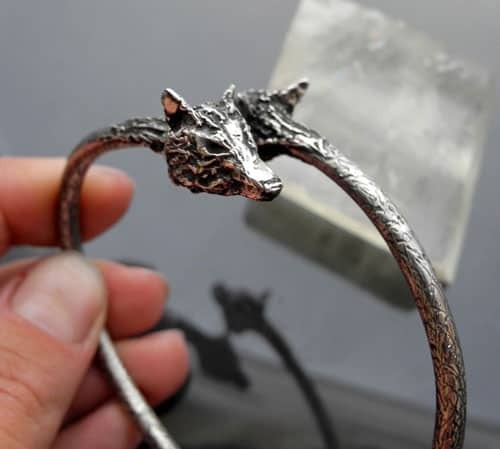 Iwona will teach you to create animal heads like her sample bracelet or maybe you have another idea – gargoyles, fairy creatures, a self portrait? Let your imagination soar! 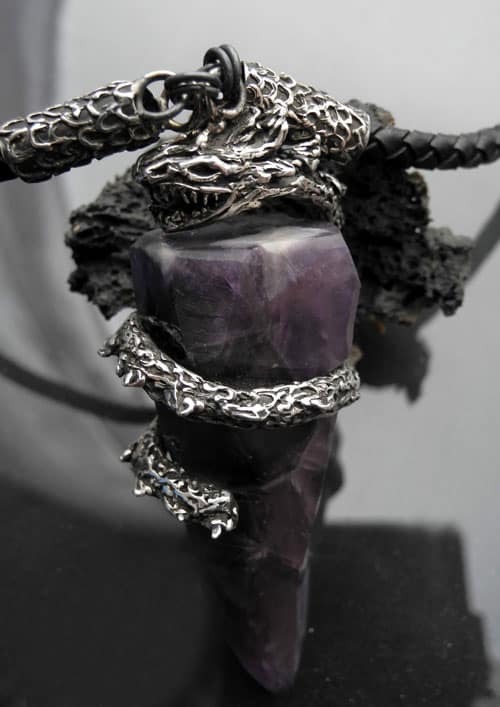 The second project is a stunning pendant with a dragon wrapped around a central focal element. 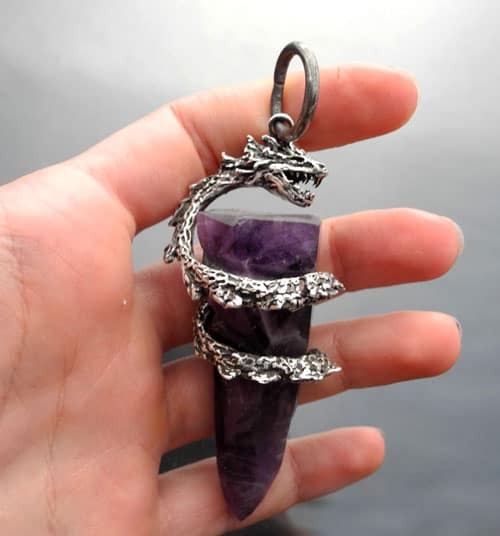 This project combines fine silver and metal clay in a way that uses the fine silver wire as a supporting spine for the dragon element. 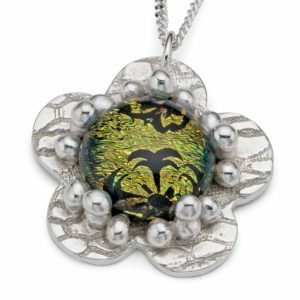 You have a choice of the focal element for this pendant. It is the only material you will need to source yourself and bring with you. This means it can be whatever you like. 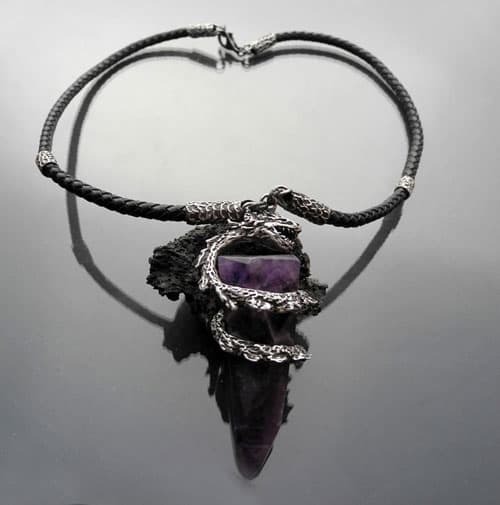 The amethyst crystal in the example was specially made for the piece. You could use a crystal of some kind, or maybe you have a beautiful piece of wood, a stone or another natural object that you’d like to use for this project. After signing up for the course, you will be sent guidelines for the size etc for this. Skills learned in this class include more complex sculpting techniques, using a supporting element, combining metal with a softer or more fragile component successfully and soldering. Before the final project there will be a rest day. This day can be used to relax and enjoy some of the sights of Cornwall or if you prefer, you may come into the studio and work on your designs. Iwona will not be in the studio on this day but Julia will. You will be able to use the studio resources or just hang out with whoever else is in. The final project brings everything you have learned together to create a stunning brooch. 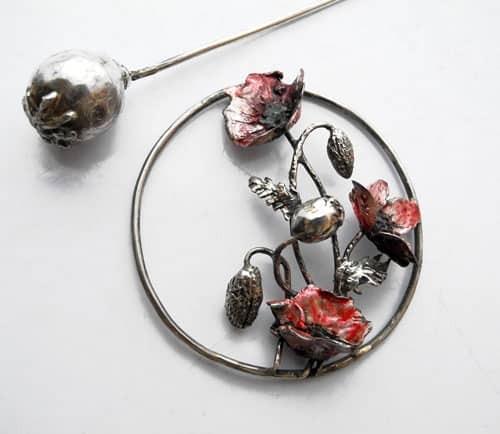 Using Sterling silver wire and metal clay elements you will create a brooch with a separate pin on a natural theme. If you have a favourite flower, you can use it as inspiration to create the elements of your brooch. Maybe you have some seed pods or shells you particularly like. These can be moulded and included in the final design. The possibilities are endless for this project. Iwona will also show you her technique for colouring which brings the design to life. Skills learned in this project include hand forming and/or moulding delicate elements, working with sterling wire to create supporting shapes and viable brooch pins and more advanced soldering techniques. What materials are included in the price? You can bring extra materials if you think you’ll need them. Had a fantastic week at Julia’s studio with Iwona Tambourska. Learnt loads from two lovely, generous and talented artists- thank you Julia can’t wait to return! I’m home after spending an amazing 6 days at Julia’s Cornwall School of Art, Crafts & Jewellery with the very talented and inspirational Iwona Tamborska . Iwona’s pieces are incredible and it was a privilege to take part in the three classes with her. She doesn’t follow a lot of the accepted metal clay “rules” and I have learnt so much! If you get the chance to take a class with her, go for it! Still some finishing to do, but I am really happy with the pieces I made.